Our universe is ruled by physics, and faster than light travel is not possible — until the discovery of The Flow, an extra-dimensional field we can access at certain points in space-time that transport us to other worlds, around other stars. Humanity flows away from Earth, into space, and in time, the Flow access to Earth disappears, so humanity forgets their home world and creates a new empire, the Interdependency, whose ethos requires that no one human outpost can survive without the others. It’s a hedge against interstellar war — and a system of control for the rulers of the empire. The above is the official plot description. For once, I didn’t steal anything. 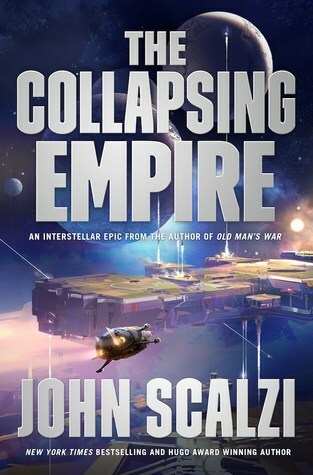 Scalzi is a very readable writer, and is the author of the Hugo Award-winning, and New York Times-bestselling Redshirts and Old Man’s War. Apparently this is the start of a new series, with two additional volumes. It is more of a political intrigue kind of story, rather than space opera, and frankly, I have lately read a fair number of political intrigue stories set in space, which smell suspiciously like political intrigue stories set on Earth, not to mention the political intrigue story we are currently living through, so I don’t think I will bother with the next two in this series, fun as it was to read.